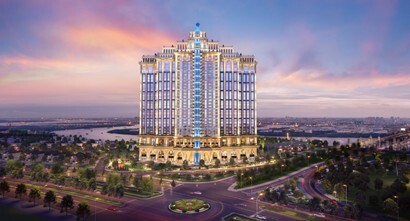 “Rome by Diamond Lotus” is not only an individual masterpiece, but also a component of the value system created by Phuc Khang Corporation, asserting a philosophy of developing green buildings imbued with heritages in ecological architecture of world-class construction, safety and green living standards. This concern has inspired Phuc Khang Corporation to create Rome by Diamond Lotus, a building project that is of investors’ increasing interest, well-located in District 2, right at the intersection of Mai Chi Tho and Dong Van Cong boulevards. “We do not intend to bring a famous western project like Rome to the heart of Ho Chi Minh City, but we want to spread the essence of that heritage to Vietnamese people who have not yet come to Rome to envisage that beauty. We want to do that by selecting most elegant European architectural values, restoring a heritage space that has been already magnificent for thousands of years and still vividly attractive. In that space, we build green sections, climate-adapted solutions, high-class living facilities and world-class security to realize the “green and secure” lifestyle of many top-notch citizens in the quintessential inspiration of European architecture. It is also a very difficult architectural and construction challenge that we set for reputable partners such as CotecCons and Landmarks to have the best solution,” said CEO Mau. Giving explanation to Rome architectural design rather than any other European styles, Ms. Nguyen Thi Tuyet Mai, Director of Mai-Archi Company, said, “Enjoying coffee with Ms. Luu Thi Thanh Mau, CEO of Phuc Khang Corporation, on a rainy afternoon in downtown of Ho Chi Minh City, we suddenly recalled Saigon - the Pearl of the Far East, Rome - an ancient, resilient but elegant and sophisticated city that has left unfading imprints through every twist and turn of its history. The project idea was thus born, combined modern ecological architecture standards with selective philosophy of classical architecture and romantic essence to construct a milestone project in the heart of District 2. 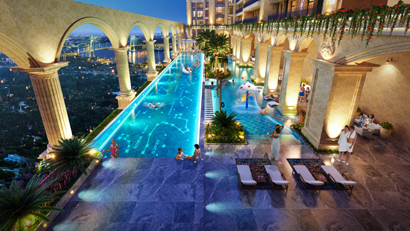 With the desire to bring beautiful, top-class experiences to dwellers, everything is subtly cared for every inch,” Ms Mai said. Speaking about the project landscape, Ms. Chau My Khanh, Creativity Director at Landmark Company, said, the very design imprints make the identity of Rome by Diamond Lotus as a reconstruction from the original architectural form, symmetry, columns, color tones and particularly landscapes. The vast Rome Square is accentuated by the majestic statue stand that creates solemnity and class for first impressions. A constellation, one of Rome's clear cultural knowledge imprints, is used as the main decoration in the Milky Way Swimming Pool. “Phuc Khang Corporation initiates and promotes a better lifestyle for community health and sustainable ecological environment of global standards,” said CEO Luu Thi Thanh Mau, featuring the mission of Phuc Khang Corporation. Recognized by prestigious international and domestic awards, Phuc Khang has gained trust by the society with green constructions in urban areas and by dwellers who are choosing Phuc Khang as a living value of human life. From the Viet Bamboo Convention Center at Vietnam Lotus Village Project (Duc Hoa district, Long An province) that was honored with the Green Architecture Award from the United States to the 5,000-square meter Sky Park Meditation Garden at Diamond Lotus Riverside Project (District 8, Ho Chi Minh City) and most recently two phenomenal cooperation events: Signing an agreement on joint venture cooperation with Mitsubishi Corporation - a 150-year old business entity - to establish Phuc Khang Mitsubishi Corporation to develop a US LEED Green housing project and forming a cooperation deal with the Underwriters Laboratories (UL) - a 120-year old well-reputed consulting and certification company based in the U.S. to review the security of the Rome by Diamond Lotus Building according to international standards, Phuc Khang Corporation clearly sketched a self-portrait of a green building developer pursuing the world trend and “shown the real strong power and great potential of Phuc Khang Corporation” as Dr. Vu Tien Loc, President of the Vietnam Chamber of Commerce and Industry (VCCI), said. “Doing business as usual, it is impractical to say that we do not care about profit. But, making money is indefinite. As we have repeatedly made clear our business philosophy, sustainable development must start from responsible development. Phuc Khang Corporation accepts to sacrifice part of its profits to bring better living values. This is also an expression of corporate responsibility to the community. That philosophy is not a cliché but expressed in our financial statements. We always want to bring better and better products and convey traditional human values ​​to future generations. We not only create valuable constructions but also create unique legacies for coming generations,” said CEO Mau.